Juandalynn R. Abernathy was born in the southern part of the United States of America where she also spent her childhood and youth. Her father the Reverend Dr. Ralph D. Abernathy was a co-founder of the Civil Rights Movement, closest friend and after his assassination successor of the legendary Reverend Dr. Martin Luther King JR. Her vocal gift was recognized and furthered during early days. Juandalynn was permitted to sing as a soloist in many churches during the services her father held. The famous Mahalia Jackson already then forecasted a career as a classical singer to the little girl. 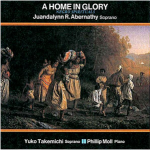 Indeed Ms. Abernathy today presents an impressive vita as an opera, concert and African-American spirituals singer. Ms. Abernathy began her vocal studies in the United States, where after obtaining her Bachelor of Music she was awarded her Masters degree at Boston Conservatory of Music. Following a number of opera engagements in the US she received a scholarship to study German at the Goethe-Institute in Munich. Voice TeachersFurther vocal studies followed under Eva Sava-Basch and Carl Davis (Stuttgart), with Ileana Cotrubas (Luxemburg) and at the Universita di Perugia, Italy, to name some. Her vocation as a concert singer became apparent. Meanwhile she has toured most European countries, Asia and the US where she filled her audiences with enthusiasm by her multilateral repertoire of songs and arias in English, French, German and Italian language. Radio- and television performances, CD- recordings, as well as solo appearances at numerous renowned international music festivals, concerts in European U.S.-Embassies, a concert for the German team during the opening ceremony for the Olympic Games in Atlanta in 1996 show her as a superb soprano of her generation. African-American spirituals are her special devotion and Ms. Abernathy succeeds at all times to present this genre with particular heartfelt conviction.